Who’s cold and cranky? Who’s damp and dreary? I am! I know that the autumn weather on the Canadian side of the world is not so bad, but across the pond in Denmark, it is endlessly gross. The sun poked its head out for about 45 minutes on Saturday, but save for that scarce glimpse, it’s been over 10 days now. Help! At one of the restaurants where I work, we make a huge pot of chai tea every single day. It starts with boiling all kinds of delicious and aromatic spices, then adding black tea, milk and honey. The first part is essentially creating a concentrate, which got me to thinking: what if I made this amount of concentrate at home and froze it for chai-on-demand! So that’s precisely what I’ve done. This recipe will allow you to have a chai supply for weeks without the waste of tea bags, with optional caffeine, and you can even custom spice it to suit your taste! Chai is a centuries-old beverage originating from India. In fact, the word chai, is the generic word for “tea” in Hindi, where as in the west we are referring to “masala chai” or spiced tea, when we ask for this beverage at a café. There is no fixed recipe or preparation method for masala chai, so where ever you drink this beverage in the world, chances are it won’t taste the same way twice! 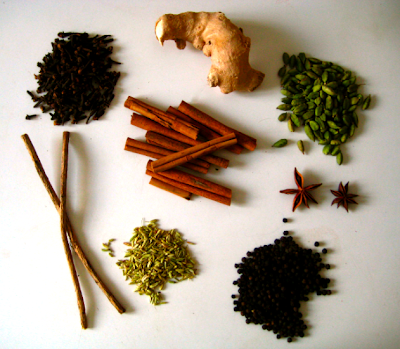 The health benefits of chai are numerous, considering the many spices it is made of. Below is a list of the spices I have included in my personal version of masala chai, and their medicinal qualities. Ginger: aids digestion; decreases arthritic swelling; destroys bacteria and viruses; lowers blood pressure; aids circulation. Cardamom: aids digestion and remedies gas, relieves asthma and bronchitis; stimulates the appetite. Black pepper: aids digestion, remedies gas; has antioxidant and anti-bacterial qualities. Fennel: aids digestion, and kidney and bladder function; relieves asthma, bronchitis, coughs, nausea; prevents gas; good for treating food poisoning. Cloves: aids digestion; kills intestinal parasites; relieves abdominal pain; has anti-inflammatory effect on rheumatic diseases. Cinnamon: aids digestion, relieves nausea, vomiting, diarrhea; has antiseptic properties; beneficial for the heart, lungs, and kidneys; aids insulin’s ability to metabolize blood sugar. Star anise: aids digestion; relieves cough, bronchitis, and asthma; good for treating rheumatism. Licorice root: relieves asthma; has many anti-depressant compounds; relieves cold and flu symptoms, coughs; relieves dandruff and psoriasis; aids gingivitis and tooth decay. 1. Place all ingredients together in a large pot. 3. Separate liquid and solids by straining the pot contents through a sieve into a measuring cup or bowl with a spout. 1. Warm milk (dairy, soy, rice, oat, nut) in a saucepan on the stove and toss in a few chaice cubes! Or pour in some of the refrigerated concentrate (use an amount that suits your taste). 3. Add honey, maple syrup or agave nectar to sweeten (this is an important step as it brings out the flavours of the spices). Sip slowly, warm up and smile. Even if the weather forecast looks dreary I can be sure that a cup of spicy warmth awaits me at the end of my day. A sachet of the spices, or a bottle of the concentrate would make a beautiful Christmas or hostess gift during the holidays. Spread the warmth and chai! info source: Balch, Phyllis A. Prescription for Dietary Wellness. New York, NY: Penguin, 2003. Pingback: Coffee and you - are you compatible? Sarah, I love your blog but please for the sake of brown people everywhere, don’t make the white people mistake of calling it chai tea. We’re overall happy that folks around the world have come to appreciate the benefits and taste of masala chai (not so great that it’s been appropriated into all sorts of other things) but the Hindi word for “tea” is “chai” so kind of redundant to say chai tea. Thanks for the awesome site and recipes. 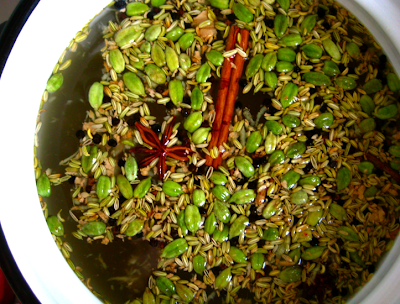 The chai concentrate is simmering and the infused syrups are next. A question – is there kind of an approximate amount of concentrate per cup of tea? I’d like to be able to give my giftees a bit of info. Happy Holidays! Just wondering about the liquorice root. It seems to have some potentially nasty interactions with other medicines, and may cause some problems for pregnant women. Any thoughts about whether the quantity in your recipe is cause for concern? Should I just leave it out to be sure? I was inspired by your idea of freezing chai to come up with a Christmas cocktail with chai ice cubes. Thanks for the great idea! A week ago I threw together some Chai Spiced Apple Butter and thought back to this fantastic post of yours. Thank you for inspiring to put my own twist on a Chai Concentrate, each time I heat it up the kitchen smells gorgeous. What magical stuff this is!!!!! I didn’t stop at tea- I’ve been putting it in all sorts of things- black coffee, green smoothies, stir fries, soups. I just hope I don’t get sick of it (unlikely though!). Thanks Sarah! I am a huge fan of Chai and never did I think to make it at home until now. Thank you!! do you throw away all the spices after you’ve strained your tea? ..just wondering if there’s anything else they can be used for, or do they just get throw away? Oh yum! I’m loving this! Thank you, Sarah! This sounds amazing. I sometimes just add a cardamon pod to my mug and brew my tea with that for a few mins… Even one cardamon pod can make all the difference. My chai simmers now and it smells amazing! Looking forward to try it! Hello! This sounds so amazing! Just wondering approximately how many cups a “large pot” would be? I just made this for my Gramma (who has all sorts of digestion and blood pressure issues) and she loved it! Thank you so much! this is such a good idea, and its tasty too! Hi Anon – GREAT idea! These would be amazing in warm cider for sure. Give it a try and let me know!